Since we moved to Barbados, I’ve become a fairly seasoned traveler. I live far away from civilization and anytime I want to leave the island, there’s a relatively long flight involved. I’ve also been fortunate enough to go on a few adventures over the past five years, requiring flights ranging from one to fourteen hours. I love, love, love New York. So I was especially excited to be able to show Jackson around for the first time! We did all the usual things one must do in New York. Started off with a Yankees game, that’s my lovely sister-in-law in the photo with Gwyneth and I below. If you follow us on Instagram, you may have noticed a recent increase in pics about wine. That’s because just over a week ago I was visiting one of my favorite places in Canada. When the Mr. mentioned he had meetings in Niagara-on-the-Lake, I jumped at the chance to join him. It’s a long flight from Barbados (six hours!) for only a few days, but it was so worth it! Two weeks ago I was lucky enough to join the Mr. on one of his business trips to Nashville. Growing up in a small, rural community means I’m a country girl at heart. Nashville has always been on my travel bucket list, and it certainly didn’t disappoint! It’s no secret, guys can be really tough to buy for. Between birthdays, anniversaries, Father’s Day, and Christmas, it can be difficult to come up with unique gift ideas year-after-year. Really, how many bottles of cologne, scotch, funny ties, and boxers with hearts all over them can one man receive? With Valentine’s Day just around the corner, why not buy your loved one an amazing experience instead of a box of chocolates? An adventure that checks something off his bucket list, or choose something that you can enjoy together as a couple. Here are a few of our favorites ideas, ranging from the extravagant to a quiet dinner for two. If you’re an avid golfer and live in a cold climate, this perhaps is your least favorite time of year. 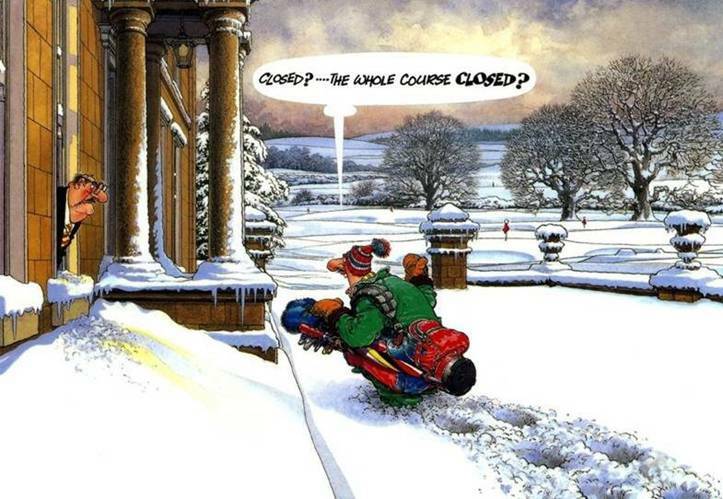 Most golf courses close or, even if they do remain open, most people just don’t head out because of frigid temperatures. I live in Barbados and we golf year round here, so I don’t quite feel your pain yet, but one day I will return to colder climates and will be feeling the effects of non-golfing winters just like you. After my trip to Colorado and doing so many things outside in the snow and cold, I began thinking, why can’t we play golf in the winter???? Why would the cold, or more specifically snow, stop us from playing? Couldn’t it easily become a year-round sport for all?! ?